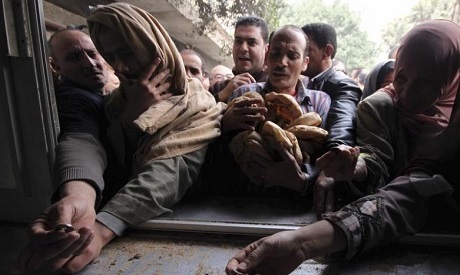 Egypt's poverty rate rose to 27.8 percent for the year 2015, compared to 25.2 percent in 2010-11, the state run statistics agency announced on Sunday. In an official report released by the Central Agency for Public Mobilization and Statistics on the international day to combat poverty, CAPMAS said "extreme poverty" reached 5.3 percent, which it attributes to a spike in prices of essential foodstuffs. The current poverty line stands at an average 482 EGP (about $54) per month while the extreme poverty line stands at 322 EGP (about $36). About 56.8% of those living in Upper Egypt's rural areas cannot meet their basic needs, compared to 19.7% in the Nile Delta's rural areas. This applies to roughly a third of people in Upper Egypt's urban areas. According to the agency, Upper Egypt's urban and rural governorates as well as Nile Delta's rural areas witnessed an increase in poverty between 2012-13 and 2015, while urban governorates and Nile Delta's urban area witnessed a drop in the same period. The report included recent statistics on state subsidies for foodstuffs, finding that 10.5 percent of subsidies are received by families in the poorest bracket; while subsidies decrease gradually to 4.2 percent for the richest bracket. Graphs provided by the agency also depicted an increase in the poverty rate in relation to family size, showing that while 6% of families with less than four members are poor, 44% of families with six to seven members fall below the poverty line. That number increases to 75% poverty for families with 10 members or more. The study by CAPMAS comes as the state works to provide essential food goods and regulate the market amid price hikes and a shortage of essential commodities. On Saturday, the country's supply minister Mohamed Ali El-Sheikh said the ministry will set the commercial price of subsidised sugar at EGP 6 per kg, to be available at ministry sales outlets. This comes amid a sugar scarcity due in part to an acute dollar shortage, which has driven unsubsidized sugar prices to EGP 9-10 per kg from EGP 4.5-6 per kg in August. Seventy-one million people currently use the government's subsidy cards to buy essential food goods. El-Sheikh said that the country has sugar reserves that can cover four months, edible oil reserves to cover six months, and wheat reserves to cover four-and-a-half months. Egypt’s net international reserves currently stand at $19.591 billion, according to the central bank.